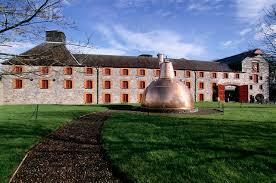 Green Spot Pot Still Irish Whiskey is produced by the Midleton Distillery for Mitchell's Wine Merchants in Dublin. It is a highly sought after and very affordable Whiskey which has attained true cult status in recent years. While no official age statement is given, traditionally, Green Spot Whiskey would have been at least an 8 Year old whiskey. Incredible flavour and oily smoothness from this example of excellence in Pot Still Irish Whiskey. Only 5,000 bottles are produced each year, making it hard to source outside of a few select Dublin based outlets and specialist Irish whiskey websites such as IrishWhiskey.com. We carry it when available and alert our customers via the website, Twitter and Facebook when we have it back in stock. It normally sells out in a matter of days, but don't worry as we normally have it back in stock a few weeks later as it is released onto the market.